In a display of compromise rarely seen during his time in office, President Obama has signed into law a $858 billion tax cut bill despite the misgivings of members of both parties. "We are here with some good news for the American people this holiday season," Mr. Obama said. The bill, which was largely worked out earlier this month between the White House and Congressional Republicans, extends the Bush-era tax cuts for all Americans for two years, extends unemployment benefits for 13 months and includes a one-year Social Security tax cut, among other measures. The measure is not paid for, and costs more than Mr. Obama's controversial stimulus package that was harshly criticized by Republicans for exacerbating America's deficit and debt problem. The president acknowledged that the bill's cost and the coming effort to address the deficit, stating, "In some ways this was easier than some of the tougher choices we're going to have to make next year." 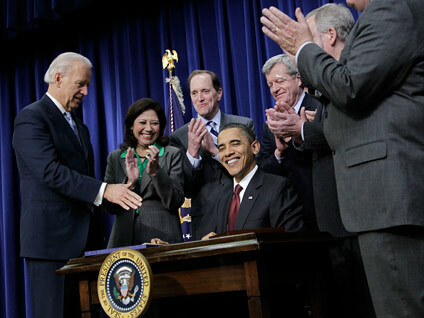 Mr. Obama said the bill would create jobs and boost the still-struggling U.S. economy. He called it a "substantial victory for middle class families" who would otherwise have seen a tax increase. "In fact, not only will middle class Americans avoid a tax increase, but tens of millions of Americans will start the new year off right by opening their first paycheck to see that it's larger than the one they get right now," he said. The president also noted the bill included tax breaks for millions of college students and their families and extensions of the earned income tax credit and $1,000-per-child tax credit. It also includes extensions of tax incentives for businesses to invest and expand and lower taxes on capitol gains and dividends. The 2 percent Social Security tax reduction would mean a savings of about $1,000 for a worker making $50,000 per year. Senate Republican leader Mitch McConnell was one of five Republicans present at the bill signing ceremony, along with 19 Democrats. It was Mr. Obama's 29th public bill-signing ceremony -- but the first at which McConnell was in attendance. The tax cut package angered liberals in the president's party due to the extension of the Bush-era tax cuts for the roughly two percent of highest-earning Americans, which comes at a cost of $120 billion over two years. They were also incensed at the level at which the estate tax was set in the measure, which exempts estates under $10 million for couples and taxes subsequent income at 35 percent. But the bill passed overwhelmingly in the Senate and also got through the House, where angry Democrats eventually accepted what came to be seen as inevitable. Still, many complained that the bill was an expensive giveaway to the richest Americans at a time when America could not afford it. Some fiscally conservative Republicans also expressed concerns about the cost of bill, though most GOP lawmakers supported it. Had Congress not acted to address the expiring Bush-era tax cuts, all Americans would have seen a tax increase on January 1st. (The average tax increase per family, the White House said, would have been $3,000.) Mr. Obama, who had long opposed extending the Bush tax cuts for America's highest-earners, has argued he had no choice but to agree to GOP demands to do so in order to avoid a tax increase on the middle class. In his remarks Friday, however, he cast the agreement as evidence that both parties can work together. "Now, candidly speaking, there are some elements of this legislation that I don't like," he said. "There are some elements that members of my party don't like. There are some elements that Republicans here today don't like. That's the nature of compromise. Yielding on something each of us cares about to move forward on what all of us care about." The president said the bill ultimately reflected "a good deal for the American people." "The final product proves when we can put aside the partisanship and political gains, we can get a lot done," he said. "If we can keep doing it, if we can keep that spirit I'm hopeful that we won't just reinvigorate this economy and restore the American dream, I'm also hopeful that we might refresh the American people's faith in the capability of their leaders to govern in challenging times."